Barbara Edwards Contemporary is pleased to present an exhibition of recent print works by selected gallery artists. “Bon à Tirer,“ a common printmaking term, which means “good to pull,” examines printmaking as a parallel practice to the themes and concerns of the artist’s concurrent work. For Bon à Tirer, Jessica Stockholder unveils a new series of prints made with master printmaker Gary Lichtenstein. The works were conceived in relation to the wooden ash tree project Stockholder created for the Aldrich Museum. For inspiration, she drew on her surroundings at the print studio, “The quiet stillness of the landscape, and the back and forth between inside and out, resonated in a sustained and lovely way with the prints as we developed them." The prints use many of the same screens in slightly altered relationships to one another and with variations in color. The shifting relationship between the prints is analogous to the shifting shape and color of the seasons, and to time as measured by shifts in light. Tim Zuck’s photogravure Eggplant was created in collaboration with master printmaker Jonathan Goodman and is directly related to the high/low themes he is presently exploring for his forthcoming exhibition. Zuck sees beauty in all aspects of the visual experience and claims no hierarchy. 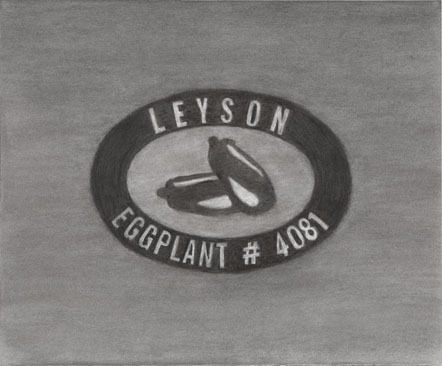 His collection of produce stickers amassed over twenty years provide the inspiration for his current work. The rudimentary still-lifes are commonplace, and yet they connect with Zuck’s eye and continue to fascinate. Taras Polataiko’s silkscreen Scotoma is based on his celebrated installation of the same name. The word means a gap or dark area in the field of vision and invokes ideas of vision, blindness and surveillance. The original installation was comprised of fourteen life size trompe l’oeil self portraits that could be removed in a reverse panopticon setting to reveal the artist’s own eyes gazing back at the viewer. Strangely the silkscreen has as disconcerting an effect in its singular form as did the original installation, stressing the relationship between vision and knowing. Robert Murray’s woodprint is transferred directly from wood constructions used to render his most recent metal relief sculptures. The sculptures explore the artist’s formal intrigue with the topography of rural North America. Seen from an aerial view, the forms become linear renderings suggesting abstract sculptural forms. Murray’s hand rubbed print is based in part on the patterns used to make the relief Lancaster County. He uses an inked wood block, which is then transferred to Japanese rice paper. This technique allows the artist to vary the density of the ink and the amount of wood grain he wishes to include. April Gornik’s lithographs Sea Edge and Storm Sea refer to her recent large-scale works of the same name. Known for her evocative representation of landscape, Gornik’s work transforms reality into a mystical abstraction. Gornik speaks of her work as an "intimate immensity" that allows the viewer to enter the work and expand or contract within themselves in accordance with the relative vastness. Rooted in minimalism and the 70’s conceptual avant-garde, Gornik’s haunted imagery reflects her relationship with nature and her desire to create something “that derives its power from being vulnerable to interpretation, that is intuitive, that is beautiful”.